Our girls dream big and aim high, find their voices and shake up the world. We fire their imaginations and unlock their talents, nurture their curiosity and harness their passions. We’re a city school – and proud of it – with an energy which drives our inspirational teaching. As a top 100 school, our dynamic approach, 21st century technology and flexible curriculum offer an educational adventure for each and every girl. Whoever and whatever she wants to be, her journey begins here. We know that choosing the right school for your daughter is one of the most important decisions you’ll make as a parent. You want her to leave home happy and enthusiastic in the morning, and return energised and enriched at the end of the day – and so do we. 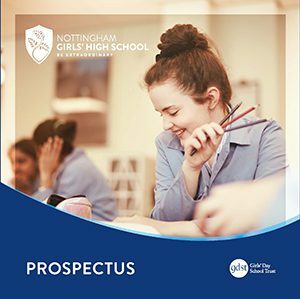 From the onset of school right through to the Sixth Form and beyond, your daughter will receive outstanding support – from her teachers; from all of our superb pastoral and support staff; from current AND former pupils, and of course from the GDST itself. There will always be advice on hand and a friendly face to turn to – we recognise the importance of this. We passionately believe, as we have always done, in a girls only education, where your daughter can belong yet be an individual; challenged but not distracted; be herself or anybody she wants to be. We know this approach works as our exam results are among the best in the country, but we believe education for life involves much more. Our school places a big emphasis on the qualities that lead to a happy, successful and fulfilling life: personal and social values, consideration for others, leadership, teamwork, confidence, self-discipline and resourcefulness. Close links between home and school are really important to us too and we look to maintain close relationships with you throughout your daughter’s time here, involving you wherever possible. By talking to and listening to you, we can ensure your daughter makes the most of her talents and opportunities, and emerges from here a credit to all of us. Of course, a website can only tell you so much, so why not have a look at our prospectus by clicking on the image. Of course we’d be happy to arrange a time for you to visit us – just get in touch. I look forward to welcoming you personally.